06:00 GMT: Protesters in Washington told RT’s Anissa Naouai that Monsanto lobbyists were hard at work even though the government was shut down. March organizers also said that Saturday’s event was just the beginning, and that the momentum for the protests would build. “GMO crops cause super weeds/super pests—requiring greater quantities and stronger versions of insecticide/herbicide poisons in all foods produced with GMOs,” organizers said in a press release. 03:06 GMT: Activists in Temecula, California stood on the side of the road exposing Monsanto’s dark history with Agent Orange used by the US military during the Vietnam War. The Red Cross of Vietnam estimates that up to 1 million people are disabled or have health problems due to Agent Orange. 02:48 GMT: Activist have marched through downtown Eureka, California in protest of GMO firms. 02:33 GMT: At a rally in Calgary security officials threaten to rescind protest permit next to the city hall. 02:15 GMT: In Las Vegas the crowd marched to the courthouse in effort to protect food production. 02:04 GMT: Monsanto protests in Seattle have been tied to a rally in support for the I-522 initiative in the Washington State Legislature, which concerns labeling of genetically-engineered foods. “I don't know what's wrong with labeling, it's not stopping them but it's giving us a choice about whether they want to eat it or not,” I-522 supporter Ingrid Hinton told King5 news. 01:50 GMT: Hawaiians are marching and organizing sit ins to protect their crops against genetic modification. “For too long Monsanto and other biotech companies have used our beautiful islands as a testing ground for GMO crops,” the organizers posted on their Facebook page. 01:37 GMT: An alternative news source the Jones Report has uploaded raw footage from the Las Vegas Monsanto march. 01:32 GMT: Jane Hash, a blogger and food safety advocate addressed the crowd in Cleveland Ohio on Saturday. Living with Osteogenesis imperfecta (Brittle Bones Disease), she told the crowd the bio chemical industry could be responsible for her disability. Ahead of the march, organizers have circulated a call to action against Monsanto and GMO. “Most GMO products are produced and distributed by Monsanto. 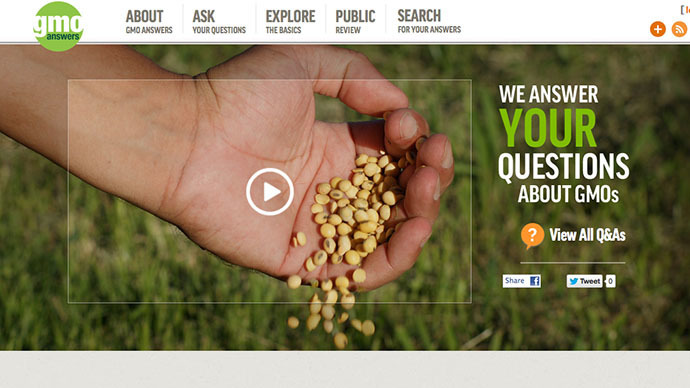 This company has shut down many non-GMO farms or has even placed their GMO seed in non-GMO crops. Monsanto is not only highly protected by the government but many previous Monsanto employees are now working for the government. This is why the government believes that GMO products are considered safe and do not require any sort of testing or labeling,” the document read. 01:19 GMT: In this year’s report by the Yale School of Forestry & Environmental Studies, one of every three bites of food depends on the pollinators, especially bees. But the research asserts that in the last decade beekeepers, in the US and Europe have seen losses of 30 percent or higher in the number of bees. By dressing up as bees protesters in Washington DC want to make agro business take responsibility for their farming methods. 01:03 GMT: More than 500 protesters turned up at Monsanto world headquarters in St. Louis, chanting anti-Monsanto slogans. Speakers at the rally drew attention to the problems they are facing from the agro business and their monopoly on the seed market. As bee populations decline, some researchers have pointed the finger at an agricultural system that relies heavily on chemicals and monocultures, farmers have warned of problems pollinating plants and in honey production. 00:40 GMT: In Ontario, Canada where Monsanto has a number of facilities including the Soybean Research Facility and Corn Research Facility, a crowd marched to Ontario's Health Minister’s office to distribute literature as part of March Against Monsanto. 00:23 GMT: Accompanied by the Brass Liberation Orchestra, San Francisco protestors marched across the nearly 9,000 foot bridge in solidarity with protesters around the world. Eric Eberman, one of the organizers, said he got involved in the movement after one of his family members died last March from colon cancer. "He had been exposed to agricultural chemicals as a child when he worked on a farm in Mexico," Eberman told KCET, an independent public television station located from Los Angeles. "I was seeking some way to express my anger at his premature and painful death and found a creative way to do so via March Against Monsanto." 00:02 GMT: Vancouver’s March Against Monsanto attracted hundreds of supporters eager to raise their voices against genetically modified food and the biotech industry. “Do we want labels on this Frankenfood so that we can make better choices for ourselves and our families? YES,” the activists said in their march. 23:57 GMT: ‘Either we stand together or we die alone song’ was the name of the anthem especially written to be performed on World Food Day anti Monsanto rally in Albany, New York. The song expresses the danger of eating GMO foods and products. 23:41 GMT: A small group of protesters have gathered outside Senator Debbie Stabenow’s office in Detroit, Michigan. Activists have called on the politician to preserve the planet. 23:32 GMT: In Calgary, Canada a group of elderly demonstrators have decided to sing ‘Old Monsanto Had A Farm’ as part of the march against Monsanto. 23:27 GMT: More than 100 people have met on City Hall Plaza to yell at Monsanto in downtown Boston. Activists posted a video wrapping up the events, sharing their reflections on global food industry. 23:14 GMT: The Millions Against Monsanto protest took an interesting turn in Tampa Florida. Also known as 'Musicians Against Monsanto' a group of resident musicians gathered to take action and educate others about Monsanto and genetically modified foods. “As Gandhi said; ‘first they ignore you, then they laugh at you, then they fight you, then you win,’ and ‘whenever you are confronted with an opponent. Conquer him with love,’” their Facebook page reads. 23:05 GMT: Over one thousand people marched from Plaza Italia in Santiago de Chile to the park Matta Bustamante earlier on Saturday. Dancing and singing the group chose a colorful way to express their dissatisfaction with the agro chemical industry. 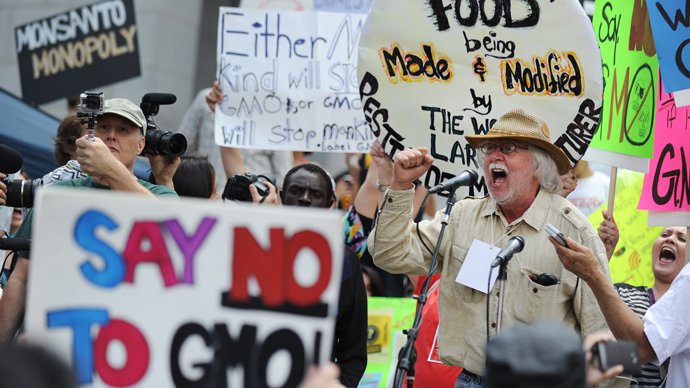 The demonstrators call to boycott Monsanto-owned companies that use GMOs in their products. The activists also demand proper labeling for GMO products and to repeal relevant provisions of the US's Monsanto Protection Act. 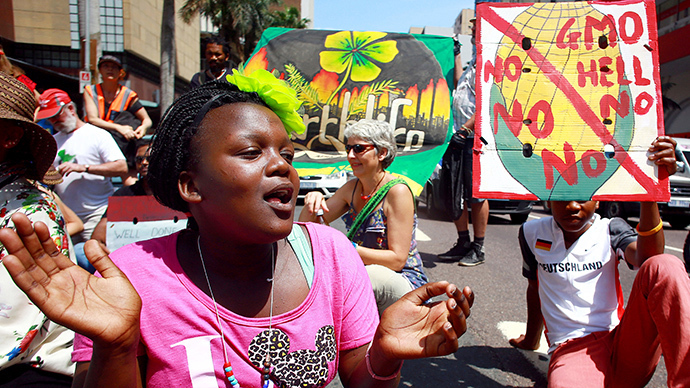 22:41 GMT: More than 200 people gathered in Orlando, Florida as part of the world-wide March Against Monsanto. "We believe we are making a contribution to improving agriculture by helping farmers produce more from their land while conserving natural resources such as water and energy," a protester told told the Orlando Sentinel. 22:01 GMT: Babies concerned about their future and their food point fingers at Monsanto at a rally in St. Louis. 21:43 GMT:“The people have the power to stop GMOs and only the people can change it” was the motto used by protesters in Spokane, Washington when they took to the streets on Saturday. 21:35 GMT: Even some dogs joined in the protest demanding a change in the food system. $MON "RT @jaaaaacobbb: This dog was walking around with a sign in his mouth at #MarchAgainstMonsanto haha pic.twitter.com/RJZO17wV3D"
21:27 GMT: Americans are demanding to know what they eat. "If you're so proud of your product, just label it," one placard read at the protest. The goal of the rally is to push through projects “that embrace the need for integrated solutions to reconnect our modern lifestyle to our food system and the land around us.” Activists also called on the city officials to become leaders of “sustainability and conservation.” The demonstration also demanded a referendum on whether to label GMO food. 21:12 GMT: Activists have gathered in San Francisco and are planning to march across the Golden Gate Bridge in Monsanto protest. 20:59 GMT: Anti-Monsanto action in Brussels saw at least 750 people march on the offices of the agricultural giant. 20:42 GMT: Whole families with children and even toddlers joined a small protest in Greenville, South Carolina. 20:31 GMT: Anti-GMO marches taking place in Chicago. #Chicago march against #Monsanto approaching Thompson Center chanting "hell no GMO" #mamo12#mampic.twitter.com/7Ulpc65Ksu"
20:11 GMT: Hundreds of activists marched in the streets of New York City chanting anti-GMO slogans and even booing passing McDonald’s trucks. Up to 800 have reportedly marched on Manhattan. 18:20 GMT: Protesters in Helsinki occupy the city center in protest of Monsanto and associated GMO products. 16:08 GMT: The US-based protests occurred in 47 states nationwide and were especially significant as October is for Agent Orange Awareness Month, currently being promoted by the Children of Vietnam Veterans Health Alliance (COVVHA). Monsanto was one of the manufacturers of wartime Agent Orange for the US government. Demonstrations took place in New York, Chicago and Colorado, among others. 15:55 GMT: The various locations at which protests are taking place worldwide. Some 500 cities are hosting anti-Monsanto and anti GMO marches, spread out over some 50 different countries. 15:47 GMT: German protests aren't just confined to Berlin; hundreds are marching in Munich, in Germany's south east. In July, Monsanto dropped its bid to get more genetically modified crops onto the European market due to the wide-spread popular opposition. 15:20 GMT: Washington DC has been overrun by a swarm of 'human bees,' mourning their fallen brothers. Controversial insecticides acting on the nervous system – known as neonicotinoids – have been repeatedly linked to bee deaths. However, it isn't only the neonicotinoids that have been causing problems for the bee population. In July, scientists from the University of Maryland and the US Department of Agriculture published a study that linked chemicals, including fungicides, to the mass die-offs. 15:00 GMT: London protests have made it to the Houses of Parliament.Hundreds of Londoners marched peacefully on the Minister of Health's London office. The city also participated in May's wave of protests, which drew some 300 participants in London alone. Over 400 cities worldwide took part in the earlier event. 14:45 GMT: Hundreds are marching in Chennai, south east India. 13:45 GMT: Further marches are scheduled for Chicago at noon. Over 700 people will be attending, according to the event's Facebook page. 13:30 GMT: Crowds are gathering in Strasbourg, Brussels and Lisbon to join the worldwide protests. In August, one of France’s top courts threw out a ban on genetically modified corn, which had been in place since March 2012. 11:20 GMT: Colin O'Neil from the Center for Food Safety told RT about the kind of pressure companies like Monsanto can exert on politicians as they push through laws and patents that work against the farmer. 10:40 GMT: A video from Youtube user Charlie Spiering shows the scene at the US Senate on October 11, when a woman threw around $2000 in bills inside the building to highlight the fact that despite the government shutdown being in place in the US, Monsanto are "still paying Congress members." 09:16 GMT: India's March Against Monsanto Mumbai has reached Bandra, next stop - Juhu. 09:00 GMT: A few minutes ago, the Moscow's own 'A March With Corn' got underway, as dozens of activists walked down the city's central streets passing out ears of corn grown without the use of GMO. People started marching from the Kuznetsky Most station and informed potential marchers that "We can be recognized by the corn in our hands." 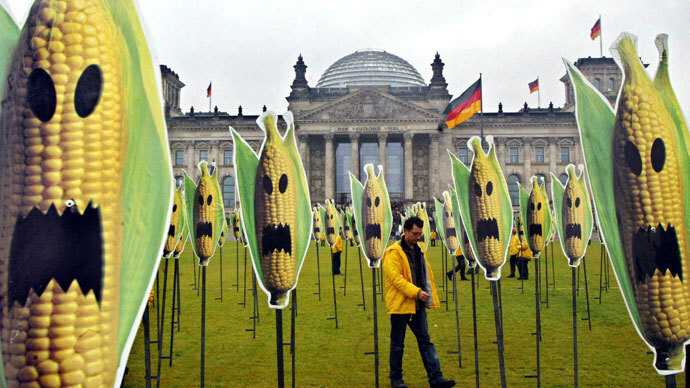 The 'Russia Without GMO' campaign started in the Spring of 2013, and is expected to collect one million signatures. 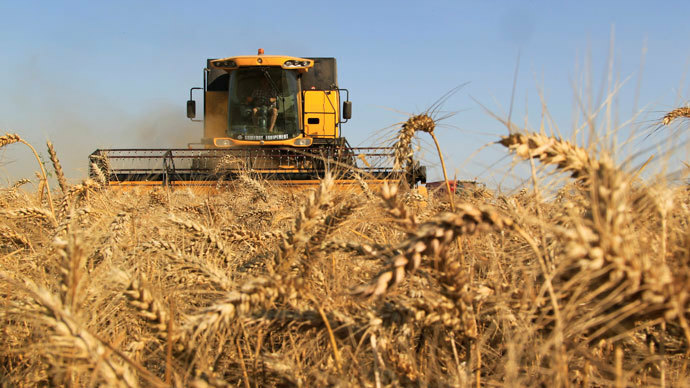 On September 23, Russia's Prime Minister Dmitry Medvedev has signed a law that would allow the planting of GMO seeds in Russia, the first of its kind. 08:28 GMT: On October, 5, Movement against Monsanto launched a global 'Twitter storm' asking people to tweet and post certain hash-tags as frequently as possible. 08:00 GMT:The schedule of worldwide MAM events can be found here.